Hi folks, AutoNBG looking for new maintainer, this addon already open source code, anyone want to get it and keep develop it, you can find it in my Github. About Curse, I can add you to Author permission, that will not effect player update this addon. Thank everyone support me develop this addon since 2014! Automatically roll according to user-defined settings within three contextual rule sets: Dungeons, Scenarios, and General. 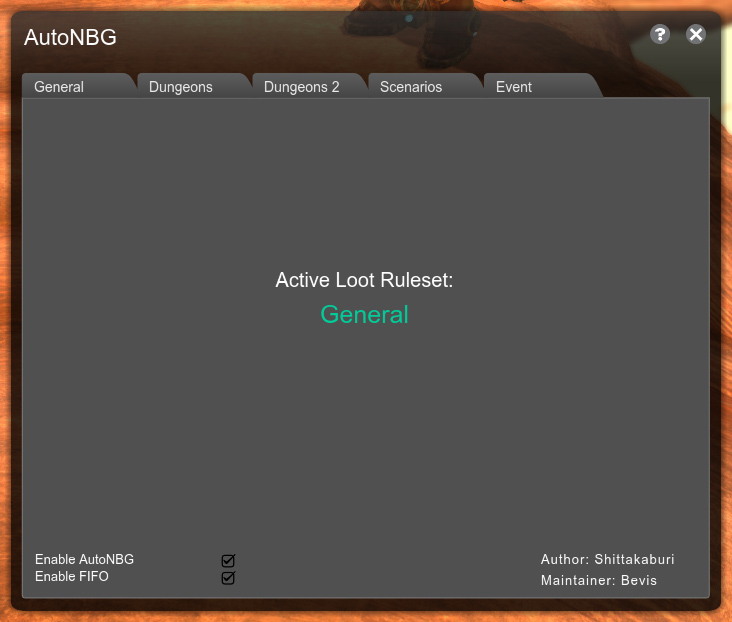 AutoNBG automatically shifts between these three loot rule sets. Viper's Topbar Information Overload supported. Kaidan Rare Boss’s rare Gadgets (like Nullity Sphere) share General option! Funcom doesn't always follow a standard system of organization, especially for items introduced in later issues, and I haven't seen every item in the game. If you experience any aberrant behavior, please report it. Unzip and place "AutoNBG" folder into the Data\GUI\Customized\Flash\ folder. Restart the game if it is currently running. Delete folder to uninstall. Thanks LivingFreak, Nylew, RedEyeEagle assist test! ps3 emulator In order to promote Batman VS. Superman, the new Warner film based on the two most important superheroes of the DC Universe, the company has decided to offer, for free, a DLC for Batman Arkham Knight, the last game of the bat.